While taking the DevOps Foundation course, through ITSM Zone , we explored the concepts of constraints. What I found most interesting was the way that this could be applied to even the simplest of everyday activities, beyond the application in IT. The theory of constraints is a practice in the ‘First Way’ of DevOps. This theory outlines that every process has a potential for a bottleneck. In the journey to improve efficiency we seek to identify and reduce the impact for these bottlenecks. When we are talking about constraints we really need to consider the way that they impact the process before and after the bottleneck. Think about it, if we improve the flow before the constraint we could have the work log jam at the bottleneck and if we make improvements after the constraint then the process will be twiddling their thumbs. In other words reduce the impact of the constraint. A method to do this is using the ‘Five Focusing Steps’ to identify and eliminate constraints. If we were to look at this in an everyday example I would take my local fast food drive-thru. A few months ago I was looking for a quick bite and decided that since the drive-thru looked not too busy that I would just drive through. As I sat in line for what seemed to be forever I wondered if I should just leave but since I was hungrier than ever I rode it out. As I got to the order speaker to place my order I saw that there was only one car ahead paying and another ahead if it which was waiting for its food so I thought the worst was behind me. Unfortunately I sat there for another 5 minutes until I got my order, which by then I almost forgot why I went there in the first place. Last week I was once again in a rush and needed to grab a bite. As I passed the same restaurant I saw that here was a sign that said “try our newly improved drive-thru” being a sucker for punishment I decided to try it out. As I pulled in, the queue looked significantly longer than before. I started to wonder if this was going to be a mistake. However the order speaker was positioned at the beginning of the drive-thru entry so I ordered as soon as I went in. Hardly taking my foot off the brake I arrived at the payment window where I asked the manager who was there about the change. He said that before the bottleneck was that the ordering and payment activities were too close together and because of this it slowed down the start of making the food. 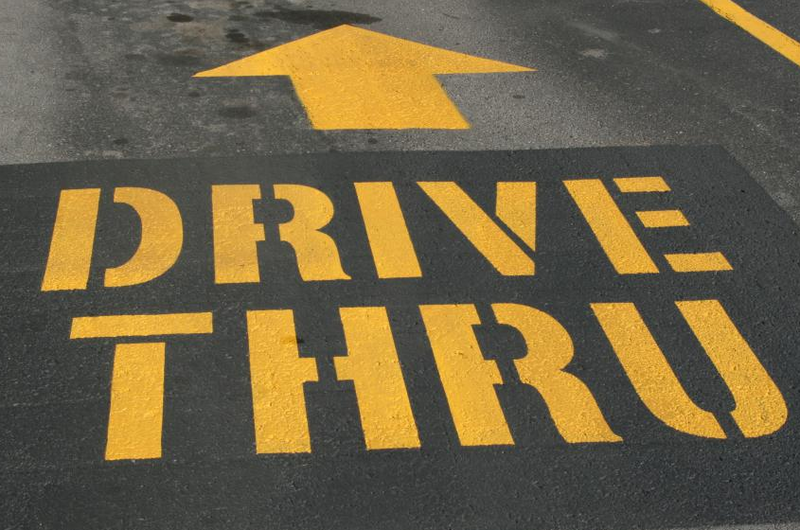 Spacing the process out in the drive-thru gave the restaurant the opportunity to complete the orders consistently. In other words they identified their constraint and made an adjustment for it to improve service. This distance adjustment made a huge difference in the way that service was delivered without impacting the internal restaurant operations.